It's almost time for systems based on Intel's Ivy Bridge chips to take their place in the spotlight. CNET says it has learned that the first of several Ivy Bridge-related announcements will transpire on April 23. 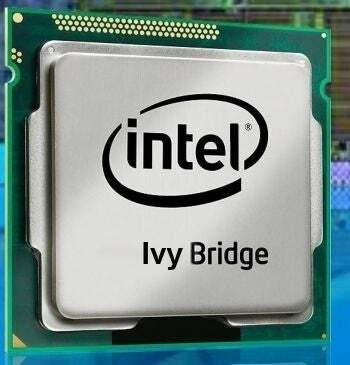 Ivy Bridge is Intel's codename for its follow-up to the Sandy Bridge processor family. Ivy Bridge shrinks the manufacturing process from 32 nanometers to the 22nm Tri-Gate process Intel detailed last year. Older processors are based on "planar" or flat 2D transistors, but there's only so much headroom in chips based on 2D processes. By switching to 3D transistors, Intel promises we'll see a 37 percent increase in transistor switching speed as well as roughly half the power consumption of 2D transistors. Intel was originally tipped to launch Ivy Bridge in early April, but rumors suggest the processors could be delayed because consumers weren't buying up older notebooks quickly enough -- partly because the economy remains sluggish, partly because Windows 8, an obvious sales driver, won't arrive until sometime this fall. In late March, the rumored timeframe for Ivy Bridge's debut shifted again to the last week of April. When Ivy Bridge does arrive, shoppers can probably count on older Sandy Bridge-based computers, particularly Ultrabooks -- which still start at $800 and range to over $1,700 -- to plummet in price. Intel’s general manager, Kirk Skaugen, recently said that current Ultrabook prices could drop to $699, and that 75 Ultrabook designs are in the pipeline, including hybrids that can shift from laptops to touchscreen tablets. CNET’s report is seconded by Asian rumor site DigiTimes, which claims Intel originally planned to announce Ivy Bridge's arrival April 29, but kicked the announcement up a week (though it doesn't say why). April 29 is a Sunday, so the original Ivy Bridge launch date doesn't add up. One of the most anticipated albeit still rumored tie-ins to Ivy Bridge's launch is the debut of 15- and 13-inch MacBook Pros from Apple. The laptops are reportedly in production, and they may resemble the MacBook Air in terms of the Air's tapered, blade-like design. When might we see those? As early as May, or as late as June, according to the rumor mill. On the Windows side of mobile, DigiTimes says to expect Ultrabooks from Asustek, Acer, Hewlett-Packard, and Lenovo in May.